We’ve all been there: you’re stuck in rush hour traffic, and your phone buzzes, announcing that new e-mail is waiting for you. Sure, you know it’s illegal to whip your device out and check it, but you’re practically stopped—what harm could there be? Well, Text’nDrive wants to help you avoid this potentially harmful position with its iPhone app that can read your e-mail aloud when your hands and eyes are otherwise occupied. Text’nDrive, currently available on the App Store, supports most major e-mail providers, and has been specifically tested with Gmail, AOL, Hotmail, and MobileMe (you can find information regarding alternate email settings on the company’s Website). 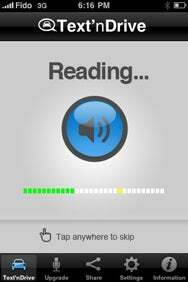 When you’re on the road with the app open, it will routinely check your messages, reading aloud (via any Bluetooth-compatible speaker or headset) the first forty-five words of any new e-mail. The company’s $20 pro version will increase that limit to 500 words and enable the ability to reply via dictation. CEO Daniel Robichaud describes Text’nDrive as an “innovative solution which we hope will entice more responsible driving habits and ultimately make the roads safer for everyone.” Though SMS functionality is not currently available, Text'nDrive's App Store page states that the feature is “under development,” and the company is looking for user feedback regarding other potential new feature requests. Text’nDrive is available on the App Store in two flavors: a free, “lite” version (with spoken word limits), and a full $20 version (which includes dictation replies). It requires iOS 3.1.2 or later. Generic Company Place Holder Txt'nDrive Lite - Listen to your emails!